Anu Malik is one of the most versatile and talented music composers in the Indian film industry today. Perhaps the only Indian composer to have as many international credits such as Monsoon Wedding, Moulin Rouge and Bride and Prejudice, he ably blends his traditional eastern leanings with western rhythms to create highly popular tunes. He was recognized with the National Award for his melodious harmonies in the film Refugee in 2000. He has also won numerous Filmfare, Screen Weekly and Zee Cine Awards over the years. In 2004, Screen Weekly awarded him the “Artist of the Decade”, an accolade well deserved for his numerous contributions to the Hindi film industry. Anu Malik is known to have a unique ear for talent and has been instrumental in bringing the talent of Sonu Nigam and Kunal Ganjawala, two of today’s hottest singers, to limelight. He is currently the popular judge of Indian Idol on Sony TV. Ravi, the young narrator of “Seven Days in Slow Motion,” is obsessed by movies, and so are his friends Hamid and Onka. So when a professional-quality HD video camera falls into their hands, of course they are compelled to go immediately into production.There are two problems: They have to return the camera at the end of seven days, and on the seventh day, they have to sit for final exams at their school. . .
For inquiries, please contact via email at info@7daysinslowmotion.com. 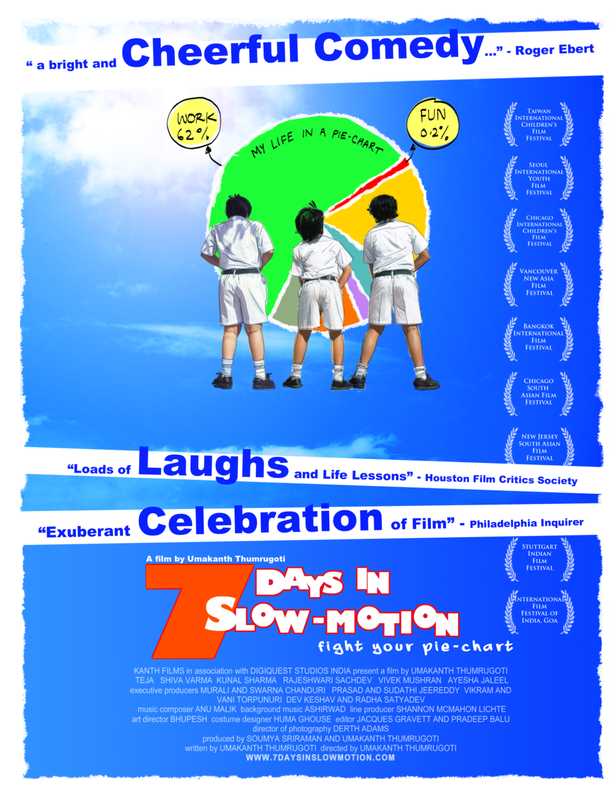 The film 7 Days in Slow-Motion is a Kanth Films Production.